Welcoming its 10th class of esteemed Southern California golf lumineries, the SCGA Hall of Fame inducted Jerry Barber and Len Kennett Tuesday afternoon in Universal City. In front of a crowd of 150 guests, Kennett, a longtime golf professional, and the family of Barber were on hand to accept the honors. The theme of the day was generosity, as family and friends of both Barber and Kennett spoke of the kindness and giving-nature displayed over decades by both inductees. Jorge Badel, senior director of golf for the Los Angeles County Department of Parks and Recreation, was called upon to induct Kennett, who he has known for years. "You are an icon in the game, and a giant in my life," Badel said to Kennett to begin his speech. Kennett has deep roots in the Southern California golf landscape. Discovering golf at a young age, Kennett found himself caddying at the newly built Santa Anita GC in Arcadia. The rest is history. After playing golf for USC and winning the 1950 Southern California Inter-Collegiate Championship, Kennett worked as an assistant golf professional, and teamed up with fellow SCGA Hall of Famer Paul Runyan to offer free lessons for junior golfers. The initiative led to a life-long passion for giving back to junior golf, and earlier this year Kennett hosted the 61st Annual Len Kennett Junior Golf Championship. "It's something I'm extremely proud of," said Kennett in his induction speech. "A number of times we've had more than 300 kids on site to compete in the event, and it continues to be special 60-plus years later." The Len Kennett Junior Golf Championship has seen golf greats like Tiger Woods, Paul Goydos, John Merrick and Brianna Do, all of whom compete at the professional level, once compete as youngsters in this coveted local championship. Along with his contributions to junior golf, Kennett also held a number of prestigious head professional positions, beginning with one at Marine Memorial GC, where he also bought his first golf shop in 1952. Kennett's resume includes a stop at San Gabriel CC, 34 years at Los Verdes GC and 22 years as the head professional at Lakewood GC. 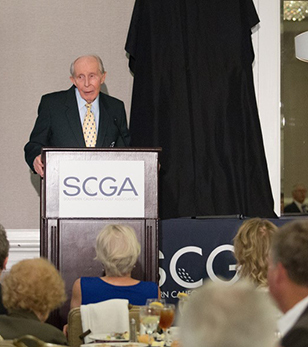 Kennett's induction into the SCGA Hall of Fame adds to his already extensive list of accolades, which includes inductions into the SCPGA and Long Beach Golf Halls of Fame. "We are all fortunate that Len Kennett chose the field of golf, for he would have been a hall of famer in whatever industry he chose," said Badel. "No matter who he is talking to or dealing with, Len always has a positive comment. He is a man of great decency." Many similar sentiments were spoken of the late Jerry Barber, who passed away in 1994 after a prestigious career in professional golf. "My dad was one of a kind," said Tom Barber, who accepted the induction on his father's behalf. "He was my hero, and I still miss him tremendously." Known for his small stature, Barber stood at just 5'5" and weighed just 137 pounds. Despite his less-than-intimidating appearance, Barber's hard work and determination propelled him to become one of the top touring pros of the 1950s and 60s. He would win seven times on the PGA TOUR, and earned a major championship victory in 1961 at the PGA Championship. In addition, Barber would play on two Ryder Cup teams. "There were two driving forces behind Jerry Barber. The first, was hard work. The second, was my mother Lucille, who passed away in 1968. He loved her so much," said Tom, who spent nine summers as a kid on the road with his father traveling from TOUR stop to TOUR stop. "I remember my dad telling me there were people with more talent, but that nobody would outwork him. It was true. Every single day we were the first ones at the course, and the last to leave." Along with his accomplishments on the course, Barber also served as the head professional at Griffith Park GC for 28 years. During his tenure at Griffith, Barber built Southern California's first double-decker driving range. He is also credited for co-inventing the full-fingered leather golf glove. "I want to thank the SCGA for this tremendous honor," said Tom, who also served as head professional at Griffith Park. "It would have meant a lot to my dad." Barber and Kennett join a Hall of Fame that includes noteworthy greats like Craig Stadler, Corey Pavin, John Cook, Amy Alcott, Charlie Sifford and Al Geiberger. Click here to view a full list of inductees. Scott Medlock is the official artist of the SCGA Hall of Fame, and honors each inductee with a personalized painting. Bought my first set of clubs from Len Kennett a Confidence LK set that was the best clubs I ever had. What a great guy! Len Kennett frequently spoke at our club meetings when I was a member at Los Alamitos GC. After the Los Al course was eliminated, we often had our tournaments at Lakewood where he was the head pro. What a gracious man. I could listen to his stories about the ‘old days’ for hours. He was a positive influence for more than his share of young people. Well done Len. Congratulations. would a PGA champion be so accessible and visible to the playing public golf. Induction of Jerry is long overdue for the man arguably the best player within 100 yards of the pin.